Uh, yeah I'm the lady in line at all the estate sales with the basket full of miscellaneous shells. Sometimes large baskets full of quite large shells and I'm getting these pitifull stares, like why would you pay good money (usually all of a dollor or maybe 2) for something somebody picked up on the beach. I buy them when ever I find them. I've got bowls full of shells all over the house but besides enjoying them as is I like to get out the glue gun and stick them to things. This project has been on my list for some time. This vintage mantle was a gift from BFF Tammy and I took off the legs and turned it into a "shelf" on my screened porch. Today was a long overdue crafting day, turning this mantle "shelf" in to a beautiful piece of art for the porch. 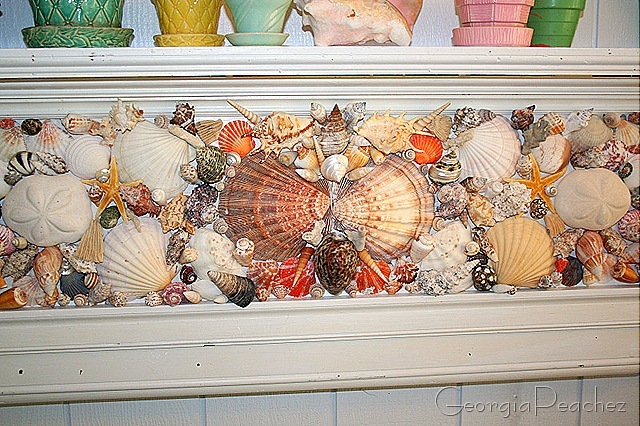 After the mantle was painted white, it was mounted on the porch wall. It functioned well as a display shelf, but it was definitely crying out for some embellishment. 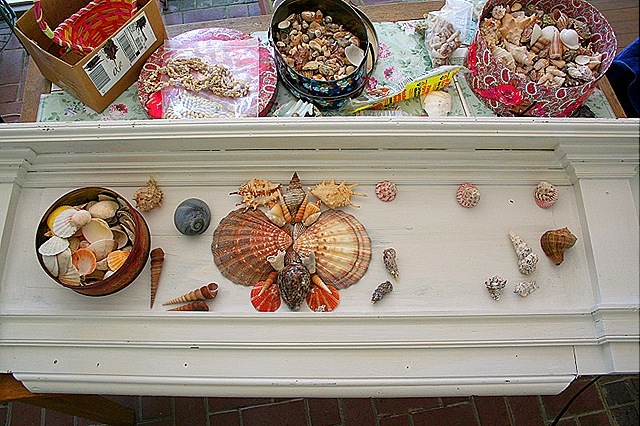 I like to start my seashell mosaic projects with a central cluster of large shells and work out from there. It takes me hours to work out the placement of all these shells. Even when I do a small mirror, I go back and forth with the placement before finally committing and setting the shells down with the glue. Ok, five hours later I'm finally done and I love it. You should keep buying shelves and making lots of these!! Great project…really turned out cute – that shelf was cute before, but now it is CUUUUTTEEE! Oh this us divine! !love love love it, it is surely worth all those pitifull looks. I need one of them myself, need one I tell you, I must off to the beach! I’m addicted to Seashells too, one of my favorite souvenirs from vacation! Thanks for the inspiration!! That’s beautiful!! It almost looks like a picture attached to the mantel!! Very cool! YAY! This is one of my summer projects. I bought a mantel a few years ago, but it’s too plain. I’ve been the pitiful shell-buyer at estate sales too and am gearing up. Do you have any tips? I’d love to hear them! Thanks so much for posting this! I know it’ll take a long time, but am psyched. I’m also now inspired to cut off the legs, since they’re pretty beat up. Suzy, I can’t thank you enough! what glue did you use?? I have been using aleenes tacky glue for all my shell projects!!! I love it too! Awesome work of art…and inspiring. WOW Love it! You go girl! Add me to the list of people singing your praise. You should be selling these. Love the shelf! So awesome – You should think about marketing your shell art work – I’m sure people would really appreciate your designs. So pretty. 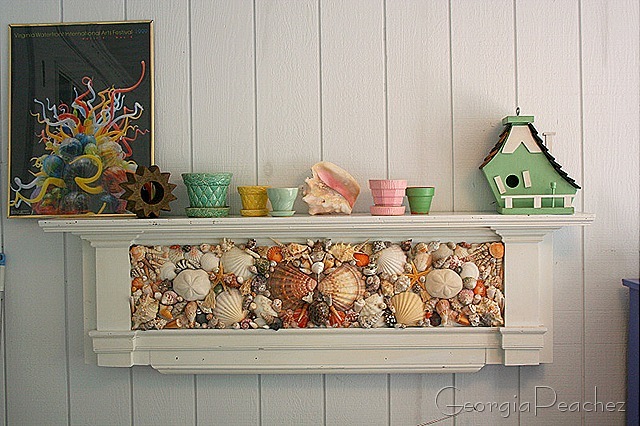 I am mentally decorating my imaginary beach cottage with it – it looks perfect! That is absolutely one of the prettiest things I’ve ever seen, Suzy! Send those photos to a magazine and share with the rest of the world! That is the so darn cute!!! What a great idea…you’ve got a cool porch my dear!! Way too cool! If I recall right cloth paper scissors was aksing for submissions of sailor valentines made of shells. You should so enter this. It is great! ohmygod it’s great-you should sell these (or “shell” them)….it’s really beautiful! WOWEE Suzy! I knew it would be cool but that’s WAY cool!! Your shelf is just beautiful! I would buy one too. woa! I love it too! This is amazing! I have never seen anyone who can see the potential in things like you can. WOW! The shelf look amazing! I love seashells. The vintage pottery on the shelf is very pretty, too! A shell art project is next on my to do list, right after I finish the never ending cross stitch project. This time I am using super tiny shells though, and I am sure it will take forever working out the placement! Love your blog page and thanks ever so much for visiting mine. That is absolutely gorgeous! You collected your shells the hard way but it was absolutely worth it. This is gorgeous! You’ve done an amazing job with your shells! I love that little birdhouse too. So cute! Visiting for the 1st time. Wonderful work. A convention of pelicans on the Salton Sea and a view of the sea and mountains from the shores of the nearby State Park. Although the resort is isolated, its advantage is that is the only place where you get the winter-time benefits of desert living and also be close to the excellent birding area that is the Salton Sea. Love it Cheryl! You are amazing. Thank you for sharing this with us. New signoff? How about “see you in the sea”? Or, “see you under the sea”? I will be glad to share with my experience.